Humans vs. Zombies prepares everyone for the start of the zombie apocalypse. You might wanna join in next year if you still want to be alive when it happens. Photo from Carl Fonticella. NOTE: Samantha Pelham is co-writer for this article. They hide among the bushes and within the shadows of the surrounding buildings. Their guns are cocked and ready to go at the sight of enemies with bandanas wrapped around their heads. Around 200 men and women fighting for their humanity. There is no place to run and hide, and all they can do is point and let their shaking finger pull the trigger. Darts start flying, spent ammo littering the ground of Baker Garage on Saturday morning. 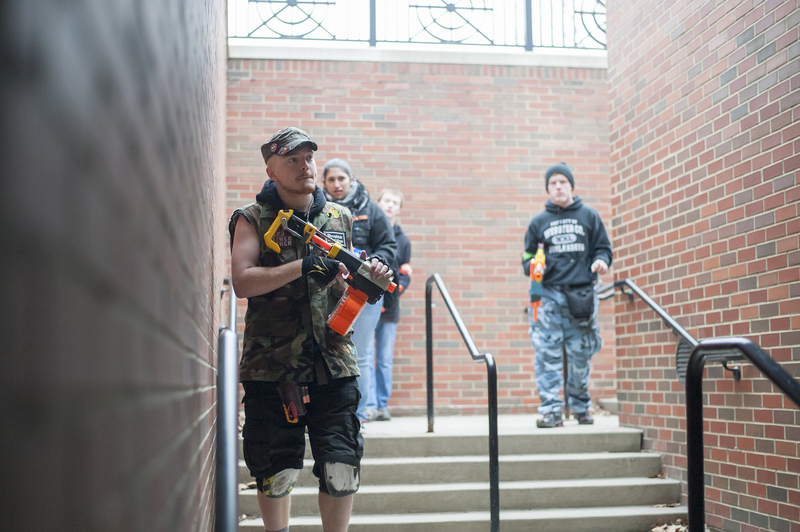 Humans vs. Zombies is a game unlike any other, played all over the country at college campuses. The basic synopsis of it is simple: You start off as a human and try not to turn into a zombie, while all the zombies are trying to turn you into “one of them.” This past weekend, from March 28 – 29, was Athens’ Humans vs. Zombies invitational game, where players from a multitude of different schools and cities join together as one to try to defeat the zombie apocalypse. Each player has a bandana designating them as either human or zombie. If they are a human, the bandanna is wrapped around their arm. Zombies have the bandannas wrapped around their heads or necks. The only way to turn into a zombie is if a player who is already one tags you on any part of your arm. The way for a human to stop a zombie is to hit them with a dart from their Nerf gun or to throw a sock bomb at them. However, this only stops the zombies for 15 minutes. Once the 15 minutes are up, the zombies respawn and are set to attack once again. There are also three other “special zombies” in the game that players have to be wary of. So the battle ensues: humans vs. zombies. Who shall win? Photo from Carl Fonticella. This zombie is “loud, angry and searching to kill,” according to the group’s presentation on rules of the game. The tank is big, but slow and moves at a constant pace. He can be temporarily stunned by a normal weapon for three seconds, but then is free to move once those seconds are up. The witch is not an aggressive zombie, unless it is disturbed from its peace. After five seconds of its activation, it is immune to all normal weapons, such as Nerf guns or sock bombs. After the five seconds are up, if it is hit, it returns to its original position. The only time players would see a witch is out on a mission. Players can tell if someone is a witch by audible zombie sounds and by a green glow stick. Remember how we said zombies respawn after 15 minutes? Well, with a boomer, this changes. If a boomer comes into play, and is killed or self-destructs, it can temporarily become a respawn point, as zombies can circle around the boomer and respawn an endless amount of times until the boomer leaves. The boomer moves at a very slow pace, allowing for quick getaways by humans. The humans think they’re going to win. Ha. Funny, right? Photo from Carl Fonticella. Invitationals are so large and require so much thought that it takes months of preparation on the part of the moderators, the ones in charge of how the game runs, to plan. 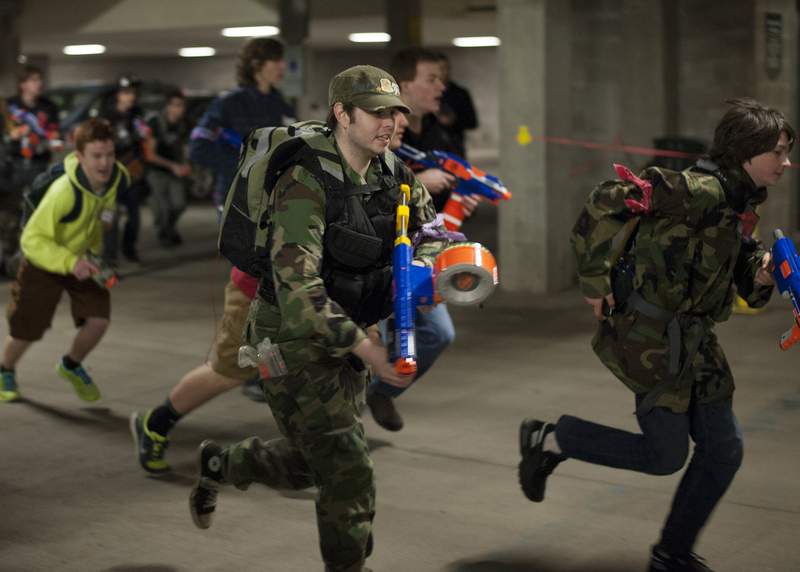 Taylor Dimmick, an avid HvZ player and moderator for years, said that for an invite that incorporates people from all over the country it’s best to start as early as possible in order to have everything running smooth come game time. For the invitational, this means starting in January and using the months before the game to come up with different missions, ideas for special ways to make gameplay engaging and ways to make sure everything is set for the out-of-towners to come play. The invitational game allows anyone and everyone to join in, no matter where they are from. We had the chance to talk to quite a few out-of-towners who were from different areas, such as Nelsonville; Columbia, Mo. ; Purdue University; Columbus, Ohio; the University of Indianapolis; Youngstown State University; Pennsylvania; and New York. The range of creativity from these players was obvious in their choice of tactics, weapons and outfits. 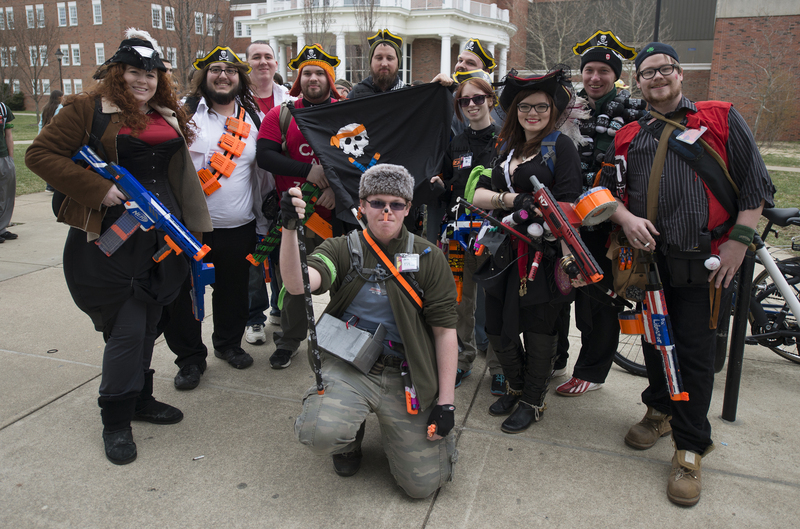 One player, Anna Kolar, was a visitor from Youngstown State University, where she is an officer for their own game of HvZ. Their goal presently is to try to make their way around to as many invitationals as possible. As of late, they have been to 10. Their favorite, however? Athens. Anna Kolar and her pirate costume and weapons. Photo from Carl Fonticella. Some more out-of-towners, a team of two from Purdue Univerisity, Ivan and Sam, were well-prepared coming into this game. 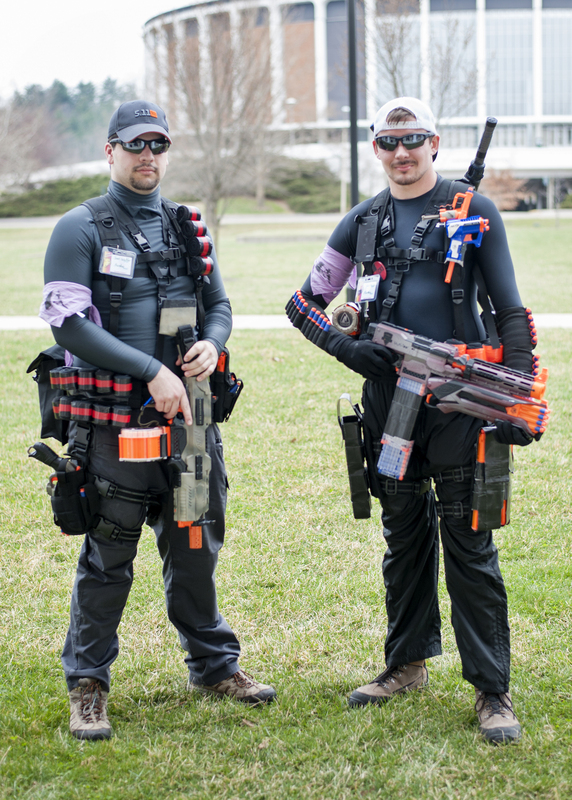 Decked out in Nerf guns and sock bombs they modified to give them an upper hand against the zombies, this army of two had put a lot of time into making their looks and weaponry be the best out there. “I got a modified Strife (Nerf gun) with an underbarrel rough-cut shotgun. Back-up plans on the back. Dual Katanas on the back; I’m not allowed to use them but it’s more of an intimidation factor. Nobody likes to mess with the guy running around with Katanas on his back,” Sam said, showing off his ensemble proudly. The two have been playing HvZ since their freshman year at Purdue, and since then have been traveling to invitationals all around. They say the traveling isn’t bad thanks to living in the crossroad state that is Indiana. Easy interstate access in the Midwest helps aid this culture of invitational traveling. The entire pirate crew. ARRRR! Photo from Carl Fonticella. What takes a lot more of their time, however, is the process of getting ready. In order to modify their normal Nerf guns, it takes roughly 10 to 12 hours, including letting the camo paint set. Sam and Ivan both said getting ready in the morning was another story entirely, though. It takes the two almost half an hours to put their entire gear on. “You have no idea how many buckles there are, because I lost count,” Sam said. Another group of warriors from the University of Indianapolis, Marcus and Luci, traveled throughout the night to arrive in Athens about 20 minutes before the start of the game’s early Saturday morning mission. They had a group of about five who traveled together for the invitational. Luci said she liked playing as a zombie, rather than a human. “I personally like being a zombie because you don’t have that anxiety of what’s going to be around the corner. You’re just always in attack mode,” she said. Marcus likes the strategies in the game. 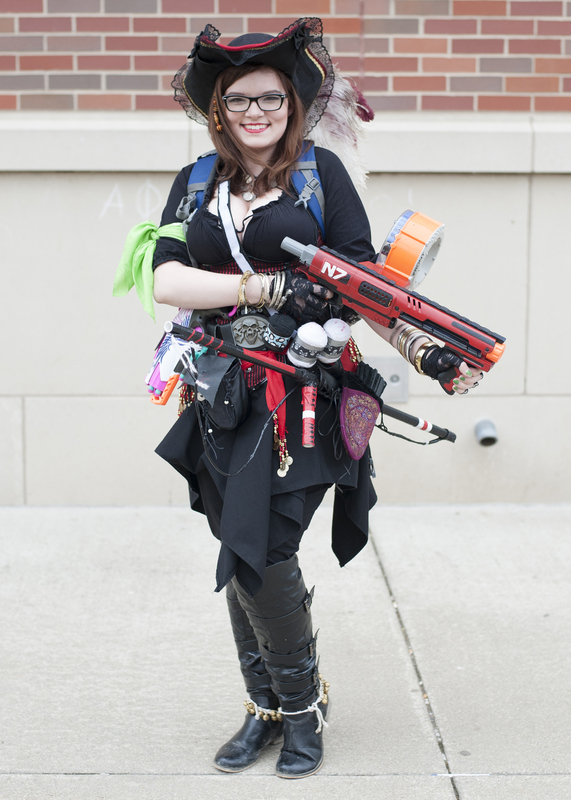 “I like seeing humans and zombies come up with different ways to try to do something,” he said. Their main tactic when out playing? Simple: survive. In order to do this, they had a special weapon with them that they created— blowgun-looking contraptions. “They’re PVC pipes, just ones that you find at a hardware store. We basically use those as snipers so we can hit people from a much longer distance than a standard Nerf gun.” One of their friends came upon the idea about four years ago, and they’ve been using it ever since. Ivan and Sam prepared for war. Photo from Carl Fonticella. In the midst of the struggles, however, they came to have fun. “You basically get to be a kid again,” Marcus said. 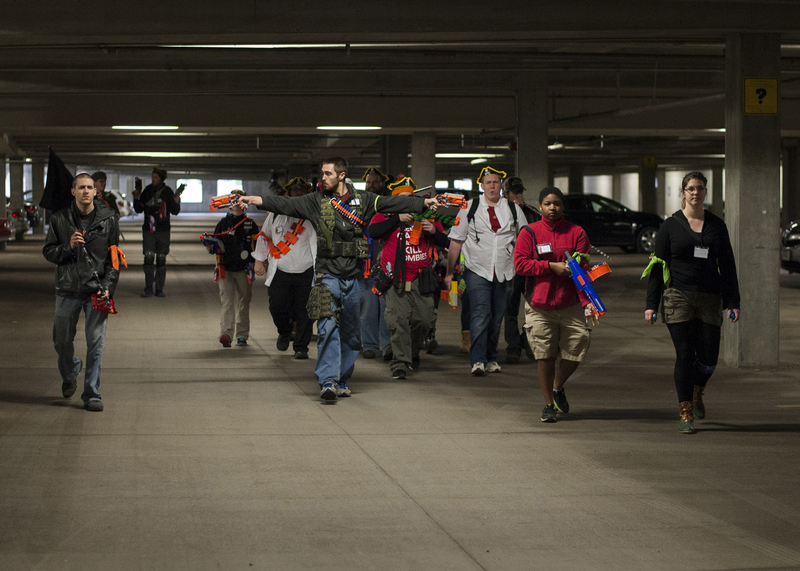 As you can tell, Humans vs. Zombies is more than just a game. It’s a test of strength, endurance and teamwork. A game in which you not only get to use your imagination to come up with tactics in an apocalypse situation, but where you get to meet new people and share in this great experience together. The invitational ended late on Saturday night amid the unseasonable snow, up on College Green. The next Humans v.s. Zombies game will be this coming fall. More information can be found on their website as the months draw nearer. So if you see random people running around with Nerf guns in their hands on campus in the future, don’t be afraid. Unless it’s a zombie. Then be afraid. Be very afraid. If you’re close enough to see these faces, consider yourself dead. Photo from Carl Fonticella. So, are you going to play in the next game of HvZ? 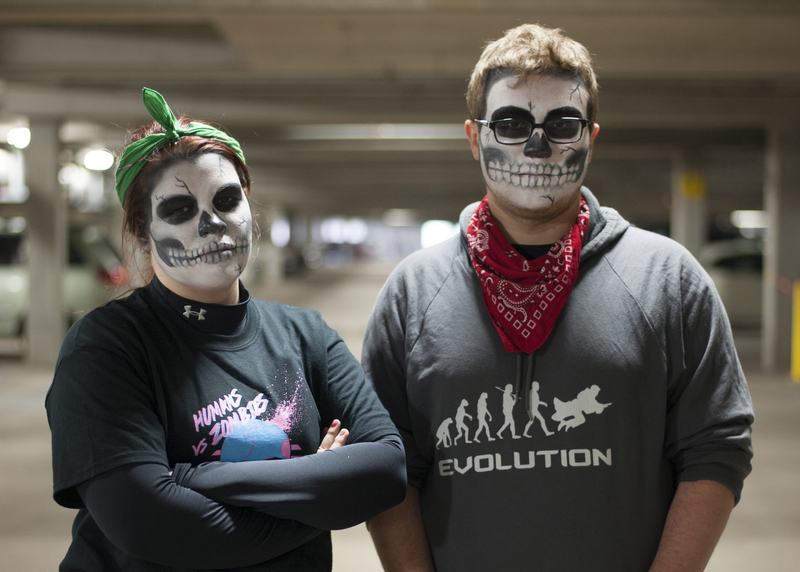 Did you see any zombies running around campus this weekend? Were you one of those zombies? Tweet us @Speakeasymag or comment below!